News from the some of the Far North, for the week beginning 8 March 2003. The week beginning 8th March, 2003. This year we've decided to wean our steer calves from their mothers before they go to the sale. That will make it easier for the person or people who buy them when they get them home, in that the calves will be less likely to run off in search of their mothers. I wonder if it'll also provide us with more prospective buyers at the sale. We drafted them, yesterday, into two separate paddocks, with a sturdy gate between them. This is how things looked by half-way through today. They'd made a muddy soup on both sides of the gate and kept me awake most of the night. Every now and then the calves would wander off and graze in the paddock of lovely new grass (best feed provided for them as they get over no longer having milk). Some of the cows spent more time grazing than standing by the gate. The calves by this stage are fully functional ruminants, i.e. grass eaters and can manage very well without milk, they would just prefer to keep on getting it. 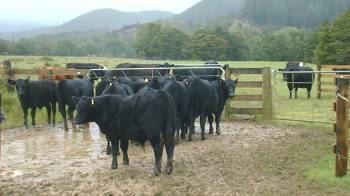 They would eventually self-wean, particularly as their mothers had their next calves, but within the beef farming system, separating them is the way to go. The calves we keep tend to gain more weight after weaning than they were gaining with their mothers at this stage of lactation, so they apparently return to contentment quite quickly after all this uproar. There are various ways of weaning calves and cows, but I favour keeping them as close as possible to each other. Presumably it's a bit easier on them, psychologically speaking, to be able to at least see, hear and smell each other while they get used to being physically separated. As I sit here, late on Monday night, having earlier walked out in the rain with a torch to make sure all is still well, I hear their miserable cries. It's hard not to imagine a malevolent resentment in the eyes of those hungry boys and their bereft mothers. Stephan and I both hate this part of the calf-raising, but the discomfort for us all lasts only three or four days and then the calves begin their independent lives and life goes on as usual. Whenever I've appeared in the paddock where the cows are grazing, they've come running down towards me, to see if I'm going to leave the gate open so they can get back to their babies! They spend most of their time at the other end of the paddock under the trees, or quietly grazing. Their boys spend most of the day eating, but every now and then they all congregate by the gate to see if their mums are there. Most of the noise has stopped now. 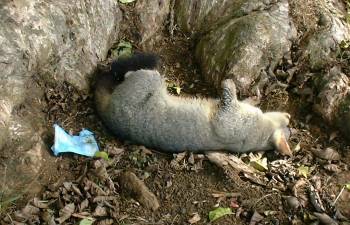 I was surprised to see this oppossum, dead under one of the big Puriri trees, with its last snack beside it. The blue package is the cyanide based bait which had been still attached to the tree. It's good to see the baits are still working, even though they are now over six weeks old. We will need to get out and hunt them again pretty soon, as we expect that replacement 'possums will have moved into our area after the big poison kill. 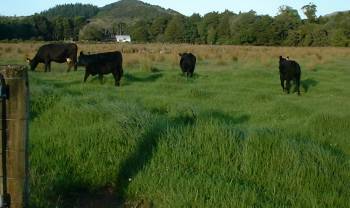 Unlike many areas of the country, we have no shortage of grass. Here are #348, her daughter and the twins, as they move into a new paddock. Sale day. Up early, bring in the boys, wait for the truck, which arrived right on time at 8.30am. It was only a small truck, just picking up our 13 boys to take them to wherever a larger truck was waiting and then on, eventually, to the sale-yards. 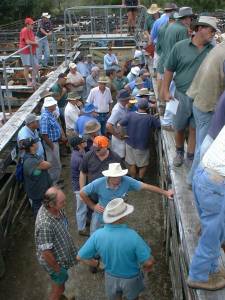 We went over to Peria in good time for the start of the sale, only to discover that our calves weren't even there! We met up with Sue, one of our Angus-breeding friends, who said she'd seen an upturned truck and trailer just down the road. We spent some time in anxious horror, wondering where our animals had got to. 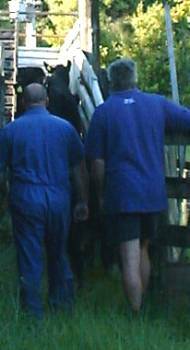 (Later of course we realised that the people who owned the animals on the truck would have been found at the saleyards by their stock-agents and would have known about it soon after the crash had happened. We heard later, that two calves had to be put down because of their injuries, but that all the others were alright and were promptly returned home to their mothers to recover.) 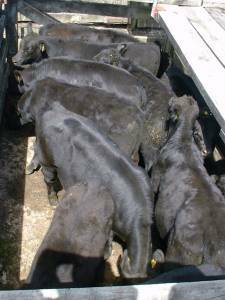 Our calves eventually arrived, the sale started and we sold them. We let them go for less than they were worth, but our feeling is that we go to the sale to sell them, they're worth what anyone is prepared to pay for them on the day, sometimes we get well over their value and this time we were disappointed. If we'd brought them home again, we'd have perhaps sold them eventually for three times what we made on them today after we'd looked after them for five times as long. We breed calves, we sell them, we enjoy it. The weather was pretty good for a sale-day. Most of the time the sky was fairly cloudy, which meant that it wasn't too hot. As can be seen in the pictures above, there is no sun shelter for the animals in the pens, nor any source of water. For the black ones on a clear sunny summer day, that can be very stressful. Back at home in the afternoon, we took the weaned cows to join the large mob of cattle of which they'd previously been part. Now unencumbered and used to being away from their babies, they quite happily ran up the paddock. I love watching the cattle when they do this. We don't have dogs, so the cattle only ever run anywhere when they actually want to. While they went one way to the back of the farm, Stephan and I went the other, to take the rest of the cattle from one paddock at the back, into the two where they would graze for the next week or so. 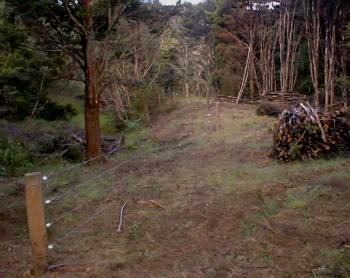 The two paddocks are still together until Stephan gets the new fence finished between them. Once we'd moved the cattle up the hill and into the new paddock, we walked down to have a look at the job in progress. 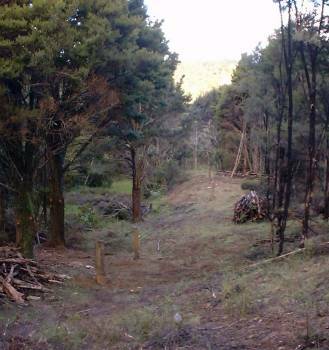 The bottom part of the fence is done, from the swamp area and up to the gate-way where Stephan constructed the new culvert (off to the left in the right-hand picture). We then let the weaned cows into the paddock from where they were politely waiting, and went home again. Stephan's mother sat in the front, since we'd offered to drive her down to see her sister, who also lives in Whakatane. 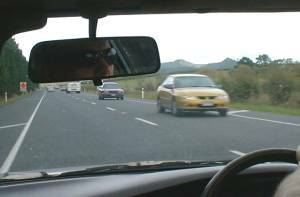 In case it has struck you as strange, the picture is the right way around - we drive on the left in New Zealand. Grant came to stay at our place while we were away, so the cats and all the birds had someone to feed them.